Of all the subjects I like shoot in in my home town, bridges are my favorite. This is one of two draw bridges to Anna Maria Island. Most bridges in the area are draw bridges and whenever I approach one in my car I secretly wish that the sirens would sound and I’d have to stop and wait. There’s no better place to be stuck in traffic than on a draw bridge in Florida. Turn off the engine, roll down the windows, and watch the boats floating by. Real stressful. In Vancouver near the Westin Hotel there is this little semi-circular walkway over the water that offers a great view of the harbour. One day I watched an otter from this spot and overheard someone mention that he frequents the outdoor pool at the Westin. Animals are respected here in Vancouver like no other city, they seem to be residents accorded all the rights, and maybe even a little more. And as far as I’m concerned that’s the way it should be. This is the Coal Harbour section of Vancouver at night. These are the still waters of Maligne Lake in Jasper National Park, Alberta. As far as lakes go, this is one of he most beautiful on Earth. Certainly there are a lot of places I’ve not been, but I digress. The lake itself is about 20 miles long and surrounded by awe inspiring peaks of the Canadian Rockies. Yes, Lake Louise and Moraine Lake are up there, but this lake is remote and for all intents and purposes, pristine like no other. No crowds, no helicopters, no room service, this is the real deal. In any case, if and when you get a chance, do check it out. If I knew the slightest thing about fishing it would be twice what I know now. That being said, I think this is a good fishing spot. I only know that on account of the numbers of fishermen that show up here after the sun goes down. And by fishermen I mean humans, pelicans, herons, …you name it, they all show up for the party. This is the Longboat Key Bridge as taken from the dock in Bradenton Beach Florida at night. And if I was into fishing, this is were you’d find me tonight. I take most of my pictures around sunrise and sunset and so tend to be a little bit frantic during those fleeting moments. Thus was the case when I shot this, I was on a trail desperately looking for a view across a pond when I just had to stop and shoot lest I miss the sun altogether. Bad timing, not enough planning, guilty as charged. I was disappointed enough that I threw this into the reject pile. Now, six months later, I was scanning my old shots and thought it was worthy of a second chance. So here, straight from the recycle bin, is a sunset through the bushes at Emerson Point in Florida. This is the clock tower and pier in Bradenton Beach Florida. I was trying to get a good picture of the moon as it sunk into the beach just before dawn, but that didn’t work out too well. Moons are hard. So I turned around and walked around this deserted beach village just before sunrise. The local bartender on Bridge Street was still sweeping up from the previous night and gave me a sideways glance as I walked the empty streets with my camera. I need to give up on moons and try this a little more often. A few weeks back when we had a lot of fog I captured this image of St Petes beach in Florida. Despite the fog these cabanas were setup and ready use. I wondered to myself who would needs these in the fog, but within thirty minutes the fog had lifted and many of the cabanas had been taken. Fog or no fog, this is a very popular beach. Another pier at Robinson Preserve in Bradenton Florida. I get so intrigued by the cloud formations in the sky that I have to check myself from time to time. Like this evening I was walking the dogs and even though we didn’t get a good sunset, the clouds were all feathery and swirly, a little like this shot. I got to thinking that I was probably the only person in the county looking up at the clouds and thinking how nice they were. Maybe I don’t want to go there and what that means, but hey, I’m easily amused and as a photographer, appreciate swirly clouds. I like pizza too. I took this last year while walking around Vancouver. I walk a lot when in Vancouver because there’s so much to see. There are a lot of other cities I need to see, Berlin is way up there. But Vancouver is just plain cool, laid back and the best example of the new age in North America. This is a view of Granville Island around dusk and as I recall it was a two mile walk back to my hotel from here, not that I minded one bit. The Riverhouse Reef and Grill is a local eatery in Palmetto Florida that sits right on the Manatee River. Every time I come here it’s crowded, but somehow we always get a table with a good view. 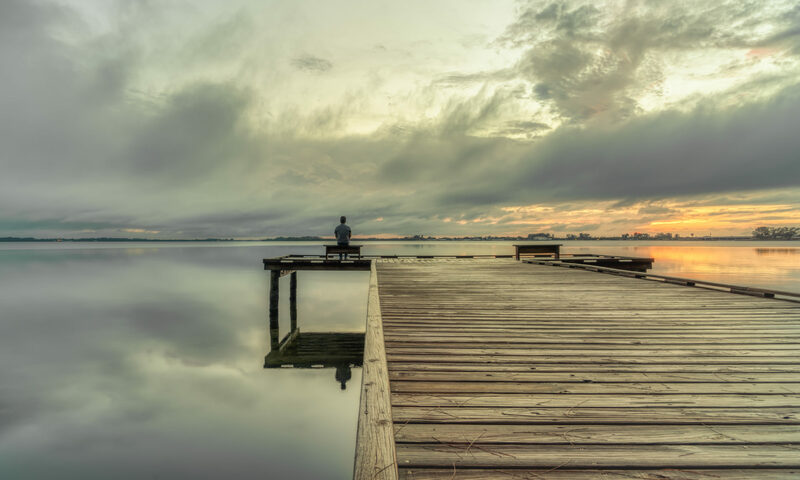 It’s not uncommon to be sitting here and have our conversation broken by something passing us by along the river, be it dolphin, manatee or just a family on a sailboat. The restaurant is way out at the end of a pier and so they provide one of those golf cart shuttles if you don’t feel like walking the length. Regardless, I always walk back since I’m usually full and need to stretch my legs.